Aurora News: Newly discovered Sleeper sites contain advanced weapon blueprints! Newly discovered Sleeper sites contain advanced weapon blueprints! 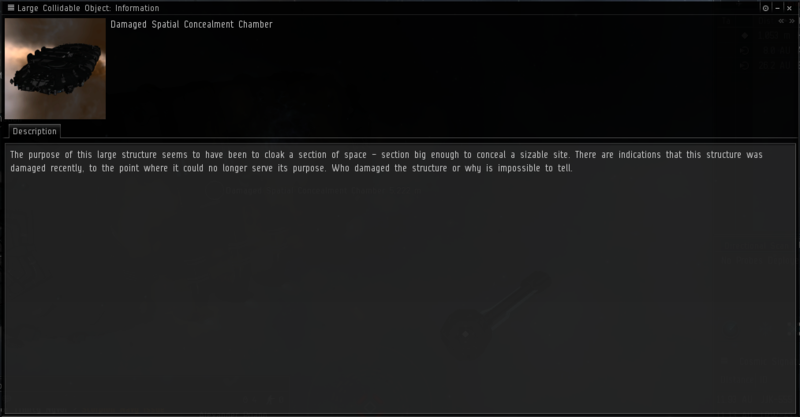 Sleepers in Caldari State sovereignty! In a recent expedition in the Lonetrek region, a member of the capsuleer alliance Ishuk-Raata Enforcement Directive (I-RED) stumbled upon a strange scan signature in the Kuoka system. Upon closer investigation, it turned out to be a Sleeper site! To find one outside the Ani constellation or wormhole systems is unprecedented! Luckily, the explorer knew of this significance and documented the exploration of the site well, you can find the report on it here: Sleeper Site Investigation Report, published by Makato Priano on behalf of the explorer. Later on a second site was discovered and subsequently a second Sleeper Site Investigation report has been made available to support the first one. These reports serve as the basis for this article, as for now, very little information beyond the reports provided by I-RED is known about these new sleeper sites. From reports it's known that the signature of the site is hidden and very hard to scan down. This means that you need high skills & good equipment related to exploring to find these rare sites. Upon warp-in, there's not much to be seen, but what can be seen is very curious. Two structures immediately attract the attention. One is a damaged construction, that upon closer inspection reveals to be a cloak generator! The other structure is identified by scanners as a 'hyperfluct generator'. It looks still intact but security systems hampered investigations. After the usage of a data analyzer to overcome this obstacle, the explorer could interface with it! A bright spacial rift, accessible to travel to a destination unknown! Upon tampering with the device, the explorer inadvertently opens a small wormhole, revealing the function of the Hyperfluct generator! But to where would it lead? And would it be safe? Driven by the excitement of discovery & the unknown, the explorer dived in, curious what he'd find. And as he exited the small rift, a small storage site, littered with containers & structures is revealed. However initial observation also shows someone was here only recently before! While recently visited, the site still harbours secrets & dangers! Rapidly, the explorer went & investigated what was still left. Quickly, several intact depots were invetarized, linked to a larger structure. Interaction with this structure was needed to make the intact depots accessible. At times, self-defense mechanisms were triggered, causing some damage to the shield of the explorer's ship. To make matters worse, several of the damaged structures leaked dangerous plasma, forming volatile clouds that would damage any ship passing through them! 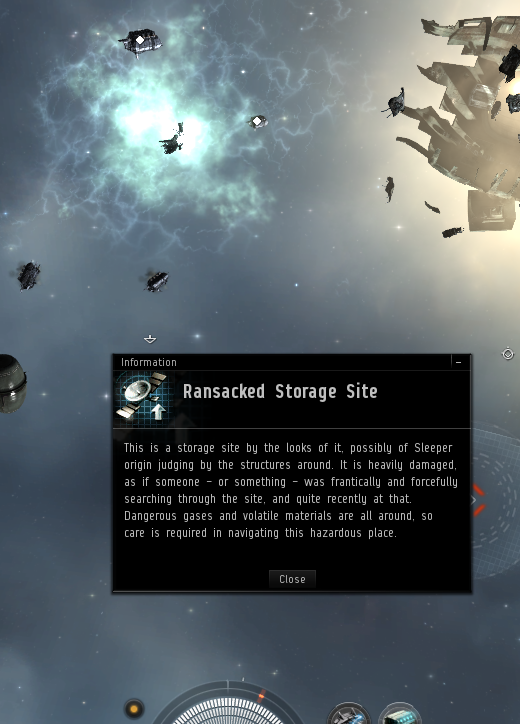 While the site was of sleeper origin, the items retrieved were curious, a variety of modules used among capsuleer ships, a science skillbook and Sleeper analyzer modules! But this all was topped by the discovery of a new weapon blueprint, a Polarized Tech 2 Heavy Pulse Laser! Polarized Weapons? Are they any good? From analyzing the blueprint, two remarkable features come up. Polarized weapons are much more deadly then their normal tech 2 counterparts but they do come with a major drawback as well! It turns out that Polarized weapons are not compatible with our defensive systems, reducing the resistance of any ship equipped with polarized weapons to zero, making these ships extremely fragile! All in all, the new Polarized weapons are a trade-off. A more efficient & deadly weapon system at the cost of range, price and ship defenses. For now, capsuleers are still searching & experimenting with these weapons in order to find a good combat doctrine. However, Stealth Bomber Pilots already expressed great interest in the Polarized Torpedo Launcher variants, as they don't care about ship resistances. All in all, the discovery of these sites is troublesome, as it means that Sleepers have been keeping an eye on us and our technology for a while. The discovery of a damaged cloak generator supports this theory along with the polarized blueprint, showing they have built up enough understanding to improve the technology of our weapons. 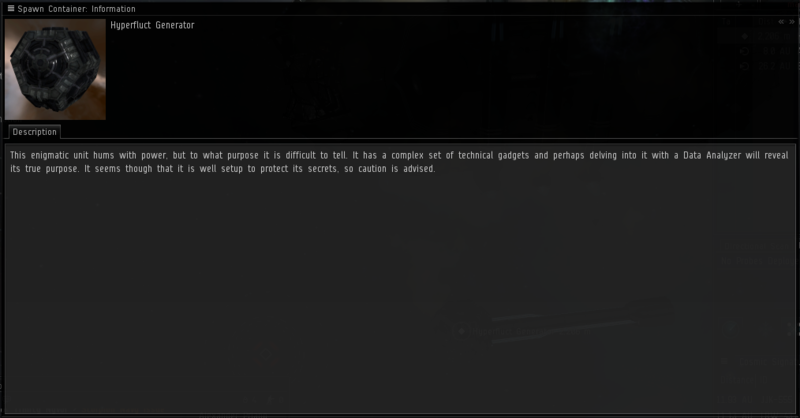 Also, the fact this particular site was discovered by I-RED in highsec space displays that Sleepers have the ability to circumvent Concord detection methods while setting up their depots. On top of this, the reports that flow in from exploring these sites all report the same, the sites have been recently damaged & looted. This indicates a third party, not Sleepers or capsuleers that can locate these sites, damages the cloak & plunders a few of the storage depots. It's likely due to time constraints that not all containers are looted. Who this third party is, is still unknown. The items found do paint a disturbing image however. It seems Sleepers are collecting our technology for analysis. 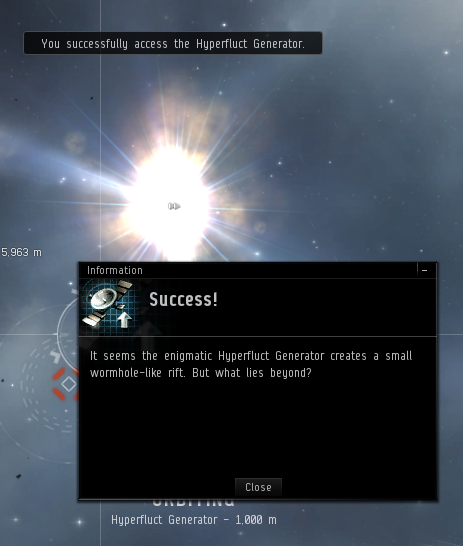 For what purpose is not known yet, but considering how capsuleers are raiding & plundering sleeper wormhole sites, it's safe to assume they research our technology to counter us. In this regard, the Polarized Tech 2 weapon blueprints are interesting. A plausible explanation for these blueprints in sleeper sites is that they're the product of Sleepers tampering with our tech to improve their understanding of it. If true, this shows they've made great strides in understanding our technology, up to the point they manage to improve upon them greatly. In addition to this, the Polarized weapons can be constructed by using regular materials, indicating the resistance incompatibility lies in it's programs or technology, not in materials used. The sites themselves are hard to find, they are hidden signatures, on par with the hardest pirate sites to locate & scan down. Additional investigations also show that most of these newly discovered Sleeper Sites lie at the egd eof the solarsystems and not enar planets, like usual sites. On top of this, you need both Data analyzers & Hacking Modules to access these sites. Also, the small rift that opens upon successfully activating the Hyperfluct generator can only be traversed by frigate-sized ships. Combine all this, and you need to be a dedicated explorer to locate and access these sites fully! Do keep in mind that all these conclusions can only be attributed to the Small Sleeper cache sites. So far, no larger sites have been found, but it may only be a matter of time. A major thanks to I-RED's official, Makoto Priano & the Explorer she represents for granting the permission to use the data acquired as basis for this article & the usage of the images to support it further. You can keep track of I-RED's progress on analyzing these sites through here: Sleeper Cache investigation reports. Capsuleer Orakkus also published his personal experiences with investigating these Sleeper Sites here: 'Limited Sleeper Sites - Finally got to completely run one' where he stresses the difficulty of exploring these efficiently thereby serving as a warning that these sites are not for the faint of heart!